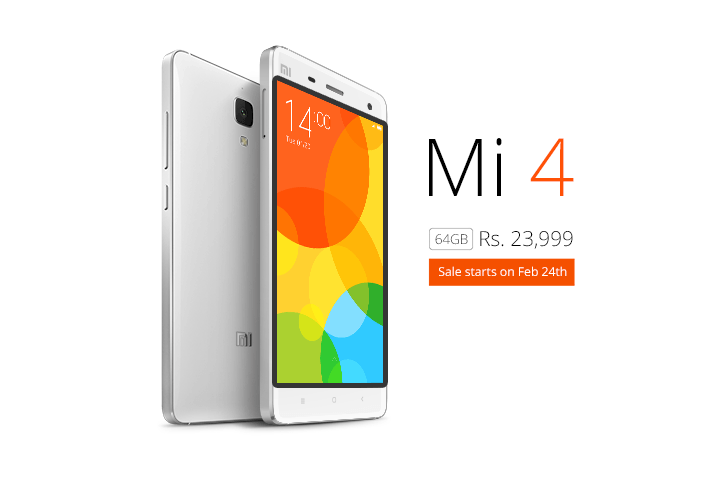 A few hours ago, we reminded you for the sale of Xiaomi Mi4 (16GB model) in India starting tomorrow. Now we found an official tweet by Mi India stating for launch of Mi4 64 GB model too in India. However, the higher model will not go on sale tomorrow and scheduled for February 24th. The 64 GB model is priced at INR 23,999 ($386) and 16 GB at INR 19,999 ($322). Both the models will be available in white color. It is not clear, if the device is LTE enabled in higher storage model or offered in same situation as 16 GB. The news is official from the company though, a more info on the Xiaomi Mi4 64GB is yet to come. Stay tuned !